Its image is well designed with plenty of aesthetics that make it look very elegant. Its front fascia consists of a bumper which is in body color. This is available to all the variants as a standard feature. While the front radiator grille in the top end is in silver, rest have it in black. Whereas, grille has chrome over its surround. On its either sides, there are dual parabola headlamps integrated. Outside door handles as well as the outside rear view mirrors are painted in body tone. There are steel wheels integrated to all the trims, while the top end is offered with wheel covers. The rear end has a sleek boot lid with a pair of radiant tail lamps surrounding it. This also has a company emblem in the center along with the other standard variant badging as well. When Fiat launched the Linea Classic, we all were skeptical about how it would perform as the 1.3-litre Multijet diesel engine only outputs 75 BHP of power and 190 Nm of torque, which is down on the regular Linea’s 90 HP and 209 Nm. Considering the regular Linea isn’t quick and the Linea Classic also weighs as much, we were expecting disappointing performance. However the Linea Classic has surprised us with the way it moves. The engine lacks VGT which has somehow become a blessing for the car in city conditions. Unlike the VGT equipped Linea diesel, this lower output motor has turbolag well contained which gives it slick performance in the city. The Linea Classic’s mill is very tractable and power delivery is linear. You will never feel the lack of ponies in city conditions. Want to amble around town at 20 km/hr, sure you can do that in third gear without a hitch. 100 km/hr comes up in third gear near the redline while cruising on the highways in top gear at 100 km/hr will make the tacho needle tick at around 2500 RPM. What further complements the Linea Classic’s drivability is the light clutch with a dead pedal although the gearbox is a bit resistant and isn’t a fast shifting unit. One can expect a mileage of 14 km/l in the city and 16 km/l on the highway with 100% AC usage. The meat of the performance comes between 2000-3500 RPM and post that the Linea Classic’ powerplant really starts to lose breath. NVH levels are good in the lower part of the powerband but once past 3000 RPM, the oil burner starts becoming audible and is very loud post 4000 RPM. The motor itself is very lethargic in the higher end of the power band and redline comes in at 5100 RPM. This isn’t a car you would want to rev hard as there is no top end power. Thus the Linea Classic doesn’t far well in outright acceleration and 0-100 km/hr takes around 18 seconds. You need to downshift on the highways to get going while overtaking. With regards to the braking mechanism of this sedan, front wheels are equipped with ventilated disc brakes whereas, the rear ones have a pair of standard drum brakes. It is further integrated with an anti-lock braking system with an electronic brake-force distribution. This will allow the driver to have stronger control over the vehicle over all kinds of roads. In case of suspension, the front axle has an independent wheel whereas, the rear axle is mated with a torsion beam type suspension. These axles are integrated with helical coil springs with double acting telescopic dampers along with a stabilizer bar. A hydraulic based power assisted steering is bestowed for much efficient handling along with tilt adjustment facility. About 5.4 meters of its minimum turning radius is very useful, particularly on narrow roads. The Fiat Linea Classic feature anti-lock braking system in Classic plus and Classic plus alloy wheel variant of Multijet diesel version. The safety features such as engine immobilizer, double crank prevention system, fire prevention system are available in all Linea Classic variants. The Linea Classic is definitely one of the most beautiful, spacious and comfortable sedans out there and the price point is particularly attractive as well. If you can make do with the lack of some features, this is the car for you. 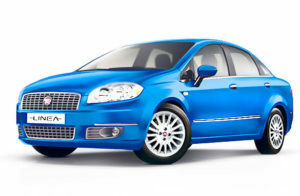 To know more about Fiat Cars in India, visit here for more details.